This is a great mattress that doesn't break the bank. I went with the 10" because I know I will move a couple times during the life of this bed and it will be a lot easier to wrangle around than a thicker mattress. I'm not sure I could even tell the difference in comfort between the 14" model I previously had and this one. Great bed at a great price! 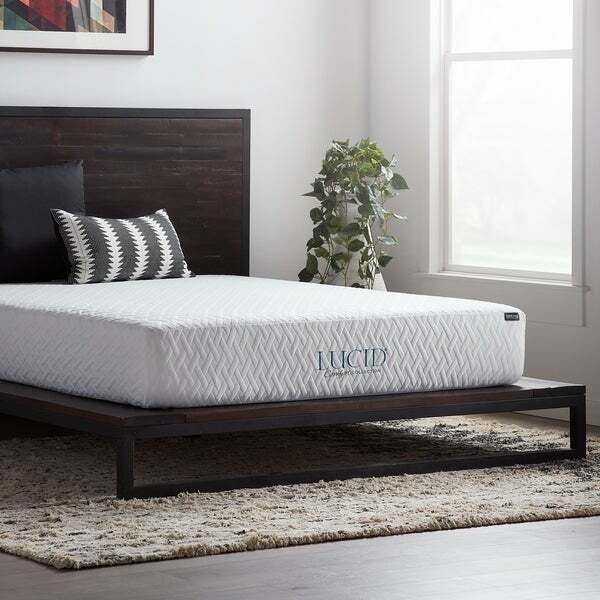 The LUCID Comfort Collection 10-Inch Gel Memory Foam Mattress offers a medium-firm-feel thanks to the pressure-relieving top layer of SureCool™ gel-infused memory foam combined with a layer of supportive high-density base foam. SureCool™ gel-infused memory foam helps regulate body temperature and deliver a comfortable and consistent sleep experience. The PureFlow™ ventilated design helps to increase airflow through the memory foam layer. A soft and stretchy elastane cover reduces uncomfortable bunching under your sheets for a smooth and serene sleep surface. All LUCID mattresses are compressed, rolled, and shipped in an easy-to-manage box for convenient shipping and simple set up. This is excellent mattress, good quality, I am feeling that it will last very long. We are using this mattress for a few months now, no complaints. Top gel memory layer and High-density foam base are perfect for my sleep. This memory foam mattress is so comfortable! This mattress has instantly improved my life. I was using an old spring mattress, which I decided to get rid of when I moved into a new house. Before my closing, I toured the local furniture and mattress stores to try things out and see what I would like to buy. The best price I found locally for a decent mattress, box spring, and basic metal bed frame, was about $650. So I decided to try out one of these boxed and shipped mattresses based on the number of good reviews I saw, and I have been so happy with my decision. First, the price is excellent. Initially, that made me skeptical because the most basic mattress I liked in the store cost twice as much as this one. But this one is even more comfortable than the one I was going to buy from the store. And with the money I saved on the mattress, I was able to buy the Priage Antique Espresso bed, which looks a lot better than the simple metal frame I would have gotten from the store. Ultimately, for this mattress and a nice bed, I paid about $430, saving around $220 and coming away with something much better than what I would have gotten from the local retailer. One of the major concerns I had when buying a memory foam mattress in general--and especially one that I would have to purchase without trying--was that all the ones I had tested in a store were way too soft for me. I like a relatively firm, supportive mattress, and I had not found a single memory foam mattress that felt comfortable to me. When I ordered this one, I expected it to be softer than I would initially like, and I just figured I would probably be able to get used to it. I was pleased, however, to find that this mattress is quite firm, and was immediately comfortable to sleep on. I usually fall asleep on my side and wake up on my back, and I have found this mattress comfortable in both positions. I should add that I am a 190 lb. male, and this mattress still feels firm under my weight. One complaint that I have seen in reviews of this mattress and other memory foam mattresses is that they stink. When I opened this mattress and left it out to inflate, it did initially have a synthetic sort of odor to it, although it wasn't strong at all, and I am known for my sensitive nose. Memory foam does outgas when it is first removed from its packaging, and this mattress was no exception. But it needs to be left for a couple days to fully inflate anyway, so I just left the mattress alone for 48+ hours, and by the time I put sheets on it and slept on it for the first night, I couldn't smell anything. I would recommend this mattress to anyone who likes a firm mattress. And given the low price, I would even recommend it to someone who is unsure about memory foam mattresses and wants to try one out. This is a fine buy on a memory foam mattress. You won't find a better quality memory foam mattress at this price. It's probably even better quality than the one I paid twice the price for a few years back because of the gel layer on the mattress. What an awesome mattress! I purchased this as a surprise to my Admin Assistant. She is going through a divorce and the mattress that she had she has had it since she got married - many, many years ago. She tends to have neck and back issues frequently - an old mattress would be a number #1 reason why. Needless to say, I have purchased two Lucid mattresses in the past (one individual coil and one Memory Foam)and I have to say that they have yet to disappoint us. It comes in a good package that gets delivered right to your front door - I had it within a week! Super easy to put on the bed - take it out of the box, lay it on the bed, take off the plastic covering and then just wait for it to open up. I let mine breathe for about 3 hours before I put sheets on it. If you haven't slept on memory foam in the past, it does take a few days to get used it. But, once you are used to it - it is absolute heaven! Super excited about this purchase! Thanks again Lucid! having perfect nights now with memory foam mattress! Lucid queen gel memory foam mattress. I really like it, but it was a little firmer than I thought it would be. I have adjusted to it.. it is wonderful mattress. It is just the right amount of softness to firmness. It does wonders for a bad back. I purchased for my 18 year old. He loves it. It just forms to your body. Very comfortable, softer than a medium spring mattress, but not too soft. The cooking factor would be a bit better, but for the price it t works pretty good. Received mattress quickly. Very easy to unpack, nice surprise to have included a safety cuter for plastic wrapping. Very mild chemical odor that dissipated after 2 hours or so. SureCool technology works as stated, mattress stays cool to touch. Took me about a month to get used to the firmness, we added a soft topper which works well. Recommend! Just got but so far for price I think it’s fabulous! I love it! We got it in two days and it is super comfortable. It took two days to cone to full height but we expected that. I highly recommend this bed. The price was amazing. So far so good. It's in a guest room to be used this weekend. Will update soon. Love this mattress, had it over a year now and still perfect, just ordered one for my grandson also. Well worth the price! Comfortable for both my husband and myself. He prefers firm and yet the mattress is still soft enough for me and firm enough for him! "how long do you think it will take for this mattress to arrive? if I live in Bermuda, which is pretty close to the US"
"Can I use this alone with an existing metal frame?" This mattress requires both support and ventilation. As long as these elements are provided, use of a box spring is optional. This mattress weighs approximately 55 pounds. "I’m getting my bed in next week and my mattress will get here tomorrow. Is it okay to leave it in the box till my bed arrives?" Yes, that will be ok. I hope it helps. Absolutely! It is rolled up and vacuumed sealed anyway. My grandson's was left in the box for a month before I put it together. "Is this king size "
No, it is a Queen, I bought a plush, if I had it to do over again, I would buy a firm. If you sit or lay in the same spot, often it leaves indentations in the mattress. It is comfortable, however it tends to lean at the edge of the bed. "how much does the queen weigh. approximate is ok. I have to ship it somewhere." about 40 to 50 pounds. "I just bought this in Oct and its sagging ...will a box spring help with sagging in the middle?" It really depends on your bed frame type. I have one with slats so a box spring is just wasted space, but if you have just 3 metal rails then it would work the same as putting one undera coil mattress. I got this delivered and in completely sinks down in the middle. It never expanded and it was a waste of money. At least I could return it. BEWARE! This one can not be returned if opened, which is a catch 22. If it expands, great, if not you are left with a heavy lump of foam!